Technical advancement is great gift for humans to simplify their life and engage in global activities. Cell phones and towers are best example which facilitate people to communicate effectively in global locations. At the same time, these advances pose threat to health of humans. Cell Towers are the base stations which control cell (or mobile) phone communication. The term “cell site” can also be used to include all cell phone towers, antenna masts and other base station forms. Each cell tower serves a small area around it which is called a cell. Service providers are scrambling to improve their coverage and to service more users, so they need to keep on building more cell sites. Increased cellphone traffic also contributes to cell tower density. When a cell becomes too busy, a frequent solution is to divide it into smaller cells, which then require more cell sites. 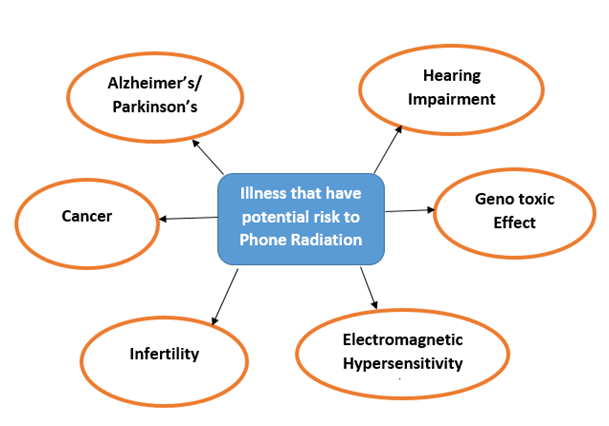 The radiofrequency fields given off by cell phones and cell phone towers is a kind of non-ionizing radiation. It is similar to the type of energy used in AM/FM radio and TV broadcast signals. Unlike ionizing radiation (as emitted by X-ray machines), RF energy from cell phones and other wireless devices cannot break chemical bonds in human body. Cell phones are designed to operate at the minimum power necessary to connect and maintain a quality call. Cell phones send and receive radio signals from a network of fixed, low-power, cell phone towers (or base stations). These towers are typicallypositioned on rooftops, towers and utility poles. The transmitting power of a cell phone differs, depending on the type of network and its distance from the cell phone tower. The power usually increases the further when people move away from the nearest cell phone tower.Radiation is defined as transmission of energy in the form of waves through space or a material medium. Radiation is of twotypes that include ionising and non-ionising. Ionising radiation or high energy radiation like X-rays or gamma rays can change DNA and it is injurious.Non-ionising radiation is low energy as produced by mobile phones or tower radios and tends to generate heat. Many epidemiology studies have revealed that heavy cell phone users may get brain cancer. Other studies on cell phone users, laboratory studies have contrasting results and these do not support above views. Scientists and researchers involve in debate on the issue of the safety of cell phone towers. There is scientific indication that the electromagnetic radiation they emit, even at low levels, is hazardous to human health. In technically advanced environment, the cell phone industry is increasingrapidly.Mobile phones and towers release electromagnetic radiation and cause numerous health effects which can be categorized into thermal and non-thermal. Thermal effects is described heating effect which people observe if they hold the phone for long near ear. Non-thermal effects on the cells, genes and the DNA and are more harmful than thermal effects. Extreme use of mobiles can lead to headache, sleep disturbance, lack of concentration, memory loss, tinnitus (ringing in the ears) and increased risk of brain cancer. If mobile towers are located in neighbourhood, it can pose health problems such as severe headache, sleep disturbance, constant body pain, memory problems, and joint pains. The more severe health effects include infertility, miscarriage, neurodegenerative disorders (Alzheimer’s, Parkinson's disease), heart problems and cancer. Changes that are permanent and stress the systems for long period of time. 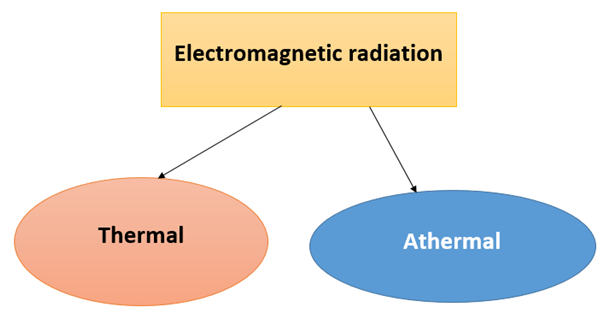 An effect of microwave radiation is dielectric heating, in which any dielectric material (e.g., living tissue) is heated by rotations of polar molecules induced by the electromagnetic field. If people use a cell phone, most of the heating effect will occur at the surface of the head, causing its temperature to increase by a fraction of a degree. In this case, the level of temperature increase is an order of magnitude less than that obtained during the exposure of the head to direct sunlight. The brain's blood circulation is capable of disposing of excess heat by increasing local blood flow. In 2011, the International Agency for Research on Cancer (IARC) categorized RF energy as "possibly cancer-causing to humans". The IARC classification of RF energy revealed that there are little evidence to prove that RF energy is a risk factor for cancer. However, enormous scientific research does not support a link between RF energy exposure and human cancers. Currently, the evidence of a possible link between RF energy exposure and cancer risk still needsmore clarification. Though many studies have indicated that the RF energy from cell phones poses no confirmed health risks, but cell phone is not completely risk-free. Several researches have demonstrated that using cell phones can be disturbing. Users may get exposed to serious injury if they use these devices while driving, walking, cycling, or doing any other activity that requires concentration for personal safety.Cell phones may inhibit with medical devices such as cardiac pacemakers, defibrillators, and hearing aids.Cell phones may also interfere with other sensitive electronic equipment, such as aircraft communication and navigation systems. With respect to cell phone towers, there is no scientific purpose to consider cell phone towers dangerous to the public. Limiting the length of cell phone calls. Replacing cell phone calls with text messages. Mobile operators are in difficult situation as people are asking companies to remove mobile towers over fears of radiation. There is no repudiating that both cell towers and mobile phones emit radiation, but the emission levels are within regulations. Voice and data telephony is conducted over invisible radio waves, which are part of a family of waves in the electromagnetic field spectrum. There are some studies that have indicated that radiation from both mobiles and towers are safe because they are low energy and non-ionising radiation that can induce only thermal effects. Exposure to radio frequency fields emitted by mobile phones is generally 1,000 times higher than from mobile towers. In Indian scenario, handsets are not allowed to emit radiation more than 1.6 watt/kilo, which is called SAR or specific absorption rate. This safety limit followed by India is far more severe than norms followed by other developed countries. In a recent report, it is claimed that India's prescribed standards for radiation emissions from mobile phone towers is higher than the safety limit but executives from the Government’s telecommunication department and major cell phone operators refute its results. In fact, with cell phones becoming more omnipresent than wristwatches there are some who are genuinely worried about the hazards of exposure to electromagnetic radiation. All electrical items like microwave ovens, hair dryers, vacuum cleaners and mixer grinders emit radiation. India's safety factor is 10 times firmer than in 90 per cent countries that follow standards set by the International Commission on Non-ionising Radiation Protection. Records indicated that India has 425,000 towers to service 900 million subscribers against 1.3 million towers China has for 1.29 billion subscribers. It is designated that the security of cell phone towers is highly debatable among investigators. Numerous scientific reports have shown that these towers emit electromagnetic radiation, they even at low levelsarerisky to human health.